This is Private Eric Smith. 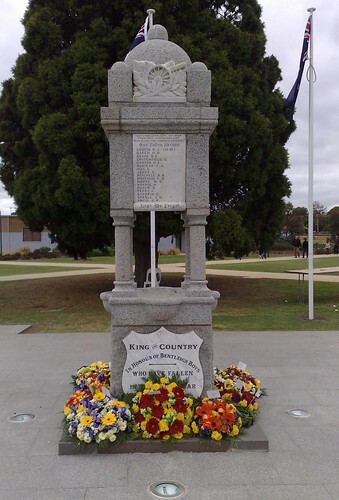 According to the Australian War Memorial listing, Eric, of Bentleigh, enlisted on 12 March 1915. This photo was taken in May. He sailed to war aboard HMAT Wandilla on 17 June 1915. He died of illness on 22 August 1915, aged 27. He was buried at sea. The listing says that his death is commemorated at the Lone Pine memorial at Gallipoli. He’s also listed among the other “Bentleigh Boys” who didn’t return from World War I, on the cenotaph. This pic taken last Sunday. They seem to do the ceremony each year on the Sunday before ANZAC Day, I assume so those attending can also go to the Shrine on ANZAC Day itself. Yep, all RSL’s hold their service and march the Sunday prior to ANZAC Day for exactly that reason, Daniel, and reunions, two up schools, etc. All the years are the same 1915. What the ? Just my sometimes clumsy writing, Steve!